bridge various disciplines and schools of thought on riding and dressage. encompass both traditional dressage breeds and non-traditional breeds, as well as horses not previously schooled in dressage. emphasize the personal connection and understanding that develops between the horse and rider. Take a look at this excerpt -- it's written in a way that I think folks will find clear and approachable. One of the authors has also posted a brief video from one of her clinics. While this isn't part of the DVD it gives you a taste of her approach. If you aren't the lucky winner, the book and DVD can be purchased for about $70 at the author's Web site. Leave a comment on this blog post describing something that you learned about horses, riding, or anything vaguely equestrian in the past year. If you post anonymously, sign or put your initials in the comment so it can be identified as yours. That's it! The drawing will be Thursday Dec. 15. Thanks to Katie for making this book available and handling the shipping arrangements. **Jane Smiley wrote two great horse novels, Barn Blind and Horse Heaven. 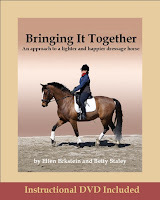 She has also written articles for popular horse magazines such as Practical Horseman. I have learned that the horse's welfare is the most important and the rider's own ego is unimportant in comparison. This year I learned that love at first sight (with a horse lol) is possible. I also learned that my own wants are unimportant, but my horse's needs are the most important. I finally learned why the outside rein is so important. It had always been an intellectual abstraction for me, a thing I knew I should do but a thing I didn't really understand how to do. I had always ridden too heavily off the inside rein, and my horse was overbent, so once I figured it out (thanks to my awesome new trainer), we started having better rides. Three cheers for great new trainers and the outside rein! I learned to take the time to really understand my horse and why he does the things he does. Before, I just trained him the way I'd always been taught, and we didn't have much of a connection, though I loved him very much. The strides we've made in our communication in the last year have been amazing, and we enjoy each other's company a whole lot more! Not to mention, he's less spooky, actually looks to me for leadership, and has beautiful ground manners. I learned that an intermediate seat will do just fine for jumping small fences! I learned that sometime a saddle makes a big difference. This year I finally bought a dressage saddle. WOW. It really puts me in such a different position! I don't have to fight to keep my legs long, back, under me - they just are. I feel so tall and balanced. My horse appreciates it too! The thing I learned this year, and have been learning since I started riding: If the foundation's not there, the house won't stand. It's okay to go back to basics no matter what level I'm at, because they're the foundation of everything. Going back to basics doesn't mean I'm failing or getting worse. It means it's time to revisit the essentials and bare things back to their simplest form - that's all. I truly learned the ability of the equine body to heal itself. After Sonny's injuries at the end of August (falling into an empty swimming pool- the deep end- after a theft attempt), we now are at once a week rides. There was about two weeks post incident that we thought we'd loose him to injury- but he made it. Now, we manage one or two slow rides a week. We're both looking forward to many more years together. Heck, I'll throw in my learning experience too. I learned that horses are much tougher, and more adaptible, than I thought. I also learned that Riley is behind his same-age peers in his standing-for-the-farrier skills. Sounds great. I love this idea seeing as 90% of the dressage instructors in my are have some sort of bad reputation. I love books and dvd's though they can offer you insight on trainers ideas that wouldn't be possible without you traveling great distances. I learned that wool flocked saddles need a touch up 12 weeks after first bought new! I had no idea. I hadn't had mine looked at since I bought it 2 years ago. I felt like a very bad rider and took it in right away. that horses are smart, very smart and riders can get played by them. I have learned how to "hear" my horse, so much so that we can have conversations like today's. Me: Let's go on the trails in the snow. Me: Yes, but it is the same underneath. Ch: No, it isn't the same, I really think it is dangerous and I'm not going. Me: Let's turn around a few times so you can get your head on straight. Ch: I'm still not going. Me: Please go. I'm sure. Ch: Sigh. OK, but this is a REALLY bad idea. Ch: (Walking forward) Rattly snort. I learned the physiological reasons why a really deep heel can be counterproductive when developing your seat. The benefits of a riding instructor who's also studied a fair bit of physical anthropology and can explain it all very well! I'm not a horse person, but I love Stacey's writing. I've learned that every horse has a unique personality and a great amount of dignity and patience (Riley as he has been recovering). Also, that riding gear is extremely expensive but that the boots are really cool! I watched my horse's foal being born and was able to imprint her immediately afterwards so I have learned about foaling this year. Also, I will be learning about handling a foal and the young horse for the next several years as I watch and work with my Yalla as she grows up. I guess it isn't so much what I've learned this year so much as having a feeling of moral support. Following Riley's situation has helped me through the various ups and downs of dealing with my old Plough Beast's health issues (which are not as major as Riley's but are ultimately will become untreatable :( ). It helps to read about other's situations and coping strategies. The blog post on Honey Bright (the QH) was very interesting to me; so much so that I have bought my own little cutting horse. She should be coming in from Texas in the new year! I have learned that there are not a lot of people who really know what the inside of the horse is all about. Most people are taking care of the outside of the horse and are not aware what the horse really needs. I have learned that when you have an older, very sick horse who is your wonderful companion of 13 years, it is the best thing you can do to put them down, as difficult as it is. I have learned that it is ok to cry buckets and grieve and be grateful for their companionship but still know that I would never bring them back to live in that used up body. I have learned that the support of friends is an important part of the journey. A simple half and half mixture of alcohol and baby oil works wonders on rainrot. I learned that sometimes taking the leap into the unknown is the best way to learn. I've learned this year, that every horse teaches you something. . it may not end up being a good match, but the struggles you endure trying to figure it out will stick with you and make you a better rider for when you do find the right match. And most importantly, something that I've learned but my herd keeps reminding me of: horses don't care about your past, and not too much about your future. They care that you're there with them here and now, and if you've got treats and a curry they'll care even more! I've learned to be okay with writing more checks to the vet. It's just money, and my horse is worth it. I've learned that even when my stomach is in my throat or on the ground, I saddle up and work on it anyway. I always feel better, even if I've ended up on the ground! I've learned that horses' coats grow according to how much light their eyes receive, not how cold it is! I've learned to relax and trust my horse. I've learned to have faith that all the time and effort I've put into him over the last seven years has paid off, and he's ready to care of me in return. I've learned a lot this year! What I learned about my riding: Dressage and contact is NOT about pulling. It's about an elastic relationship. What I learned about my horse: She's a hundred mile horse. During this (hopefully temporary) unhorsed time in my life, I have been studying Thoroughbred pedigrees, specifically which lines are associated with soundness issues. I have learned that certain Native Dancer lines are associated with unsoundness, and he himself was notoriously unsound (although brilliant) during his racing career. I have learned that I need horses for my mental well-being more than I ever thought. I have had to take a break due to a lack of time and finance resources and I have noticed that I feel more anxious, less in control and in need of a "barn fix" in some major ways! I've learned horses are great supplements to chemotherapy! Since I'm undergoing chemo, being able to go to the barn and ride is a great stress reliever and keeps my fitness level up. The oncologist is pleased and says he may recommend it. And Bless her little palomino heart-she is being an angel! I've learned that I should have appreciated my mare more than I did. One day she was here - and the next day, we had to put her down. Completly out of the blue. The worst part - I didn't even get to say goodbye to her. It was early morning when she went down and the vet was called. Hearing my trainer describe how scared she was because she couldn't get up - how bad I wanted to go back in time and just be able to go to her and pet her all over and tell her it would all be okay. I can't stand thinking how scared my baby must have been. It's gonna be hard to recover completly from loosing her. The first time I first got on her, I heard a click go off in my head, and that was it. She was the one. To have expierenced sheer joy just by looking at her, always having a good day even when the ride was bad, loving her for every little bit of her - not just how she rode, and then being the only one she would do absolutely anything for. Remembering our first and last trip to the 2009 District and State 4-H shows (I'm a youth. ), the most relaxed canter she's ever given me during a trail ride over the summer of 2009, our "scary fences" training over the summer of 2009. I'm so sorry for your loss. I hope your mare had people who loved her at her side. My hope for Harv is that he will not be alone or afraid when he passes. While I want to be at his side I take great comfort in knowing that the people at his barn are caring, wonderful people who will make him comfortable. I learned to drive our new truck and trailer and to feel comfortable showing alone. I have learned so much this year, I'm not sure what to pick! The most significant thing I learned that it is possible to overcome fear of riding after a bad fall. It helps if you learn that a young, barely-broke horse is not suitable for an adult rider with lots of anxiety, and that even though it is hard, sometimes it is best to move on to another horse that can help bring enjoyment back to riding rather than fear. I learned about growing out a better hoof wall, how to treat hock & fetlock arthritis, how to ride in 20 meter circles, that a horse may actually move forward better with less leg pressure, and that I can stay in the saddle without gripping the horse like a vise with my knees. I could go on for the rest of the evening but will stop there for now. It has been a tough but rewarding year, and I so look forward to the next one, especially trying our first dressage schooling show! Merry Christmas & thanks for the wonderful blog! I learned that a horse that's been down for sometime can get temporary paralysis from their limbs falling asleep. Great tip. I learned to camp with my horse, in the national forest with no power, running water, or cell service. It was awesome- I even slept on a cot in the horse trailer. Never having camped before it was something completely new to me! Oh and the 25 mile ride was the best, can't wait to go again. I've learned that a schoolmaster is worth his weight in DIAMONDS! I've learned how to refine my riding, my aids, and my communication with my horse. I've learned that being with, and caring for my horse is as much fun as riding. Finally, I've also learned that as certain as I seem about not being nervous about showing, my body never lies, and the tension shows! My first season showing was this summer. I've learned I really CAN trust my horse! I have learned that mules are approved to participate in dressage by the governing body that regulates the tests! I was shocked and amazed as well as pleased. I have learned that there really isn't a lot of difference between disciplines...good horse training is good horse training. And we are all trainers whether we know it or not as we handle and ride our horses. I have learned that whoever said "healthy as a horse" obviously never owned one!